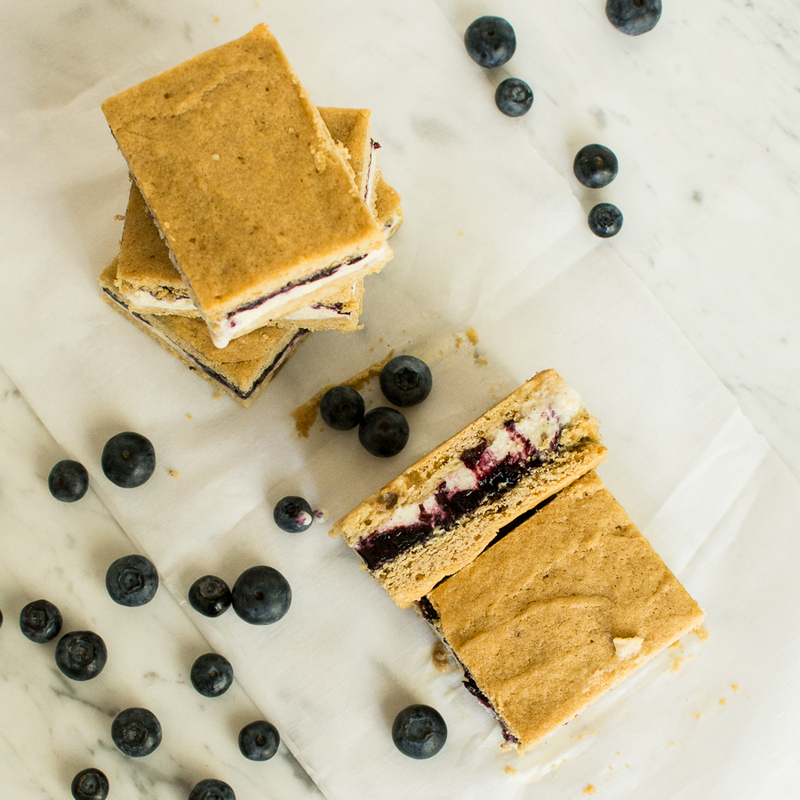 Is there anything better than ice cream sandwiches on a hot summer day? The cool ice cream dripping down your hand while you try to devour the ice cream sandwich before it all melts! The ice cream trucks are in full swing in our neighborhood, you know the little tune they play that gets stuck in your head, ya that’s the one… It’s Summertime in the PNW! Summertime makes me feel nostalgic every year. The kids playing in the streets until dark, the sound of ice cream trucks, sprinklers with little ones running through them, the smell of backyard BBQ’s, car washes, backyard parties until late night…..oh the list goes on! One childhood memory for me, and not a good one either, was this cherry tree we had in the back yard. I ate so many that summer, that I got sick and hated the taste of cherries from that point on! Just last year, I braved the cherries and love them once again, but in moderation of course :) Ice cream also reminds me of summer. When I was a kid, we would play all day outside, only checking in for lunch, then back out we went. There were no cell phones back then to call home! When we heard the ice cream truck, we would run as fast as we could to ask mom or dad for a few bucks, then ran after that truck to get a taste of summer! Aaaahhh the simplicities of summer! When I heard the ice cream truck recently in our neighborhood, I immediately wanted to make my homemade ice cream. I loooooove homemade ice cream, it’s smooth and creamy and made from real ingredients, and you can mix in anything you want! For these sandwiches, I made a vanilla bean ice cream and mixed in lemon zest at the end. To cut down on time for these sandwiches, you can buy vanilla ice cream and just add the lemon zest to it. The Blueberry compote is really simple and easy to make also. It only takes about 10 minutes, and another 60 minutes to chill. Most of the time is chilling time for these ice cream sandwiches. Then we have a blonde cookie bar that is baked in two shallow pans in under 15 minutes. 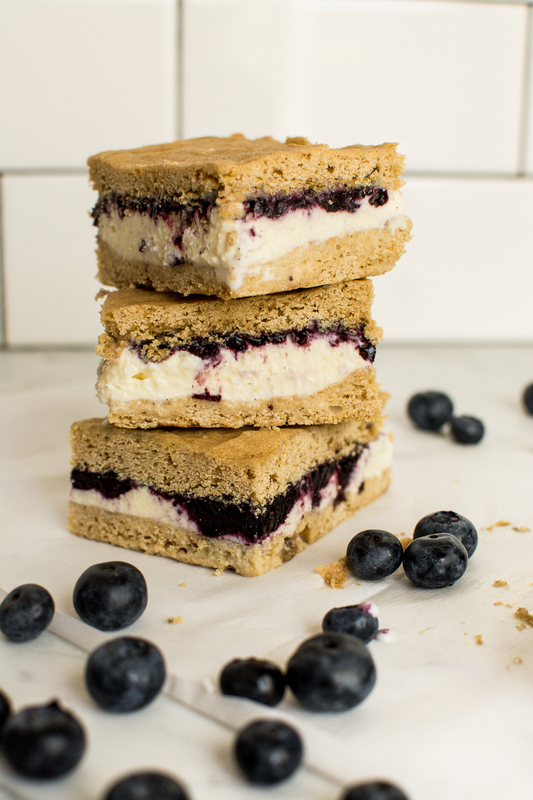 The not to sweet cookie crust goes really well with the zesty ice cream and sweetness of the blueberries. These are so refreshing for summer! I think these are my favorite ice cream sandwich so far this summer! What is your favorite ice cream treat in the summertime? If using store bought ice cream, soften ice cream enough so you can mix in lemon zest and juice. Place back in freezer until ready to use. Line and butter 2 8 inch square baking dishes. Butter the dishes on the heavy side so the parchment paper sticks to the butter, this will be very handy when spreading the dough out. In a large mixing bowl or electric mixer with the paddle attachment, beat together butter and brown sugar until mixed and fluffy. In a separate bowl, whisk together the flour, baking powder, baking soda, and salt. Set aside. Add egg and vanilla to butter mixture and mix until smooth. On low speed, add the flour mixture until combined well. With an offset spatula, spread half the batter into one of the pans, and the rest in the other pan. The dough will be a little stiff, spread as smooth and evenly as possible. Bake for 12-15 minutes, just until set. Let cool in pans on wire racks for 30 minutes. When cool, lift one of the cookies out and leave the other in the pan. In a medium saucepan over medium high heat, cook blueberries, sugar, and zest, mashing blueberries to make them as smooth as possible and release juices. Cook until sugar has dissolved. In a small bowl, mix cornstarch with lemon juice, add to the pan of berries.As soon as mixture starts to thicken, take pan off heat. Transfer to a bowl to let cool for about 1 hour. When ready to assemble the bars, spread softened ice cream over cookie crust that was left in the pan. Drop spoonfuls of blueberry compote on top of ice cream. Run a knife through to lightly swirl into ice cream. Top the other crust on top of ice cream/berry mix and place in freezer for 4-5 hours before slicing. To slice bars easily, use a knife dipped in hot water. Makes 9 ice cream sandwiches. Is there anything better than ice cream? NO! I haven’t thought about ice cream sandwiches for a long time!! But, how fabulous would this be to make the day ahead of time and stick in the fridge and then serve to guests who are over… yep, putting it on my to do list for this summer! I was the same way as a kid! Outside all day long. I love the idea of adding blueberries. I will have to try it. My favorite frozen treat these days is bananas dipped in chocolate. yumm..
Oh wow, this is all kinds of yumminess! I will definitely be giving it a try this summer! Thanks for this great recipe! 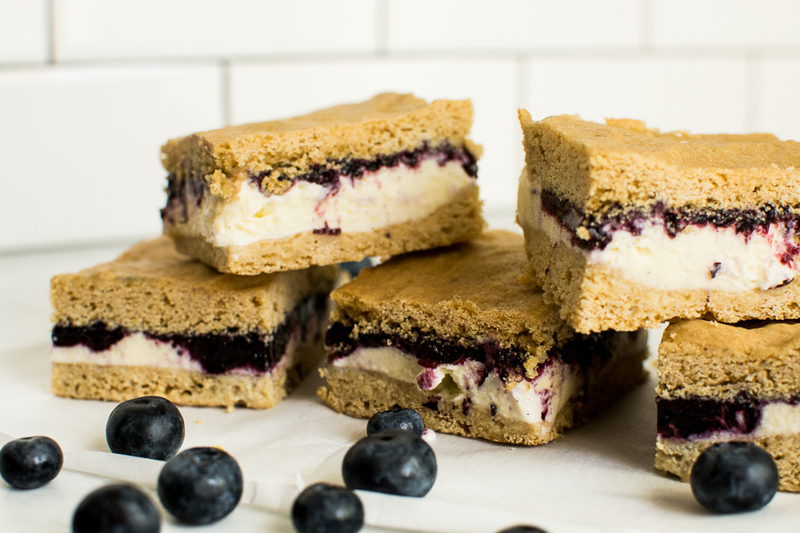 My blueberries have just come in and they’ll be great in this ice cream sandwich.